For those fascinated by graceful, colorful butterflies, getting a good long look isn't always possible. The gentle little insects are there one minute and flitting away the next—so although you might get a chance to watch one delicately sip nectar from a flower or groom and sun himself on a leaf, those moments are fleeting. Build a homemade butterfly cage to temporarily house a butterfly or two so you can watch them up close. Commercial and professional butterfly cages come in all sizes, from small duffel bag size on up to ones as large as a greenhouse or even bigger. For professional lepidopterists those larger butterfly cages are useful for observing many different butterfly species—30 or more at a time. Your homemade butterfly cage can be as big or as small as you'd like to make it, although the amateur butterfly enthusiast usually requires cages on the smaller end of the scale. A typical homemade butterfly cage is circular with a diameter of 1 or 2 feet and a height of between 5 and 6 feet. Not all butterfly cages have floors. Some are constructed with a top and sides but leave the floor open so you can set them directly over live flowering plants for the butterflies to feed on. Bridal netting and tulle are useful materials to make a homemade butterfly cage. They're lightweight, see-through and will safely house the butterflies you catch. Other supplies you may need when making your cage are quick-drying glue, washers, nuts, lightweight chain, twill tape, ribbon, string and cardboard. When constructing a butterfly cage that is enclosed on both ends you should get 6 feet of 4-foot-wide bridal netting, 2 feet of twill tape or ribbon, and two circles of cardboard, both 12 to 14 inches in diameter. Fold the bridal netting into thirds so that it creates a rectangle measuring 2 feet by 4 feet; then tie one of the 2-foot ends closed with a 6-inch piece of twill tape or ribbon. Tie the other 2-foot end closed with a 12-inch piece of ribbon. (The ribbon on this end is longer because you're going to use the excess to hang the cage.) Slide one of the cardboard circles between the overlapped pieces of netting and push it to the bottom of the cage (the end tied with the shorter piece of ribbon); then slide the second piece of cardboard into the cage and push it to the top. You'll need to use a few dabs of quick-drying glue to keep the top in place. Just hang the butterfly cage from a tree branch or ceiling hook and place the butterflies inside by slipping them between the overlapped netting. You should make the inside of your butterfly cage as homey and comfortable as possible to keep your winged guests content during their stay. If you construct a cage that can be placed right over live plants you won't have much interior decorating to do. 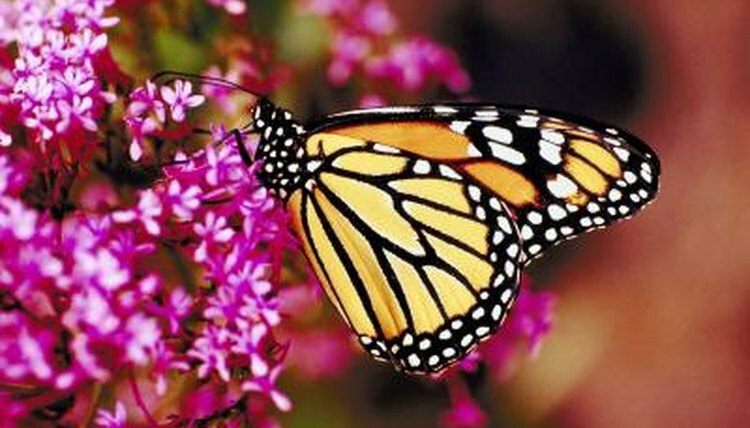 The plants will provide the butterflies with a source of food as well as places to perch. If you make an entirely closed cage, though, you should put a tree branch inside for a perch. Being a good butterfly host also includes providing food for the butterflies while they're in captivity. Use a fresh dish scrubber—the round, colorful plastic mesh type. Get one that's never been used and set in a shallow dish that is almost as deep as the scrubber is tall. Boil a mixture of 1 part sugar to 4 parts water and cool it before pouring it over the scrubber in the dish up to the halfway point on the scrubber. It's easy to become mesmerized by a butterfly as you watch him fluttering about, eating, grooming and just being himself. Don't be tempted to lock him up for life, though. Keep the butterflies you catch for only two or three days, then set them free. It's true that professionals raise entire generations of butterflies in captivity, but from the amateur's point of view—and considering that a butterfly's life span is as short as one week—it's much more kind to keep their captivity to a minimum and allow them to live out their lives in freedom. Butterfly School: How to Make Your Own Butterfly "House"